[Washington Post] The Senate overwhelmingly approved Sen. John F. Kerry (D-Mass.) as the next secretary of state Tuesday afternoon, with three Republican "no" votes. He assumes the post amid a civil war in Syria that has killed an estimated 60,000, stalled nuclear negotiations with Iran and the spread of militancy across North Africa. U.S. relations with Russia are at a low point, the United States is struggling to manage a changing relationship with a rising China and the prospects for new Mideast peace efforts appear dim. 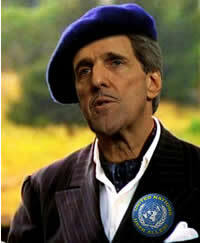 Three Republicans voted against Kerry -- Texas Sens. Ted Cruz and John Cornyn and Sen. James Inhofe of Oklahoma.